Header Banner kit: Santa's Coming from Touched By a Butterfly! from Touched By a Butterfly Designs!! you can save 40% on all of them this week only! Here are some fun things she'd like you to know about her! My name is Celeste Lombas. I am a stay at home mom of my beautiful daughter, currently living in Panama City Beach, FL. I have been a paper crafter since I was a little girl. 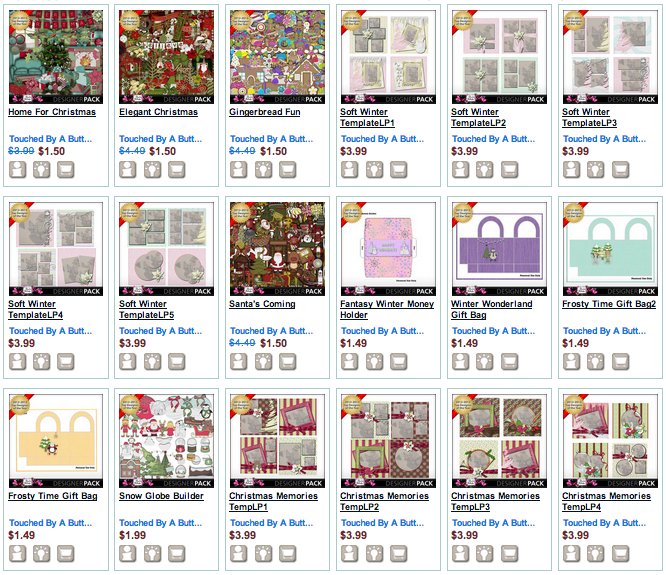 I have found a new love of digital scrapbooking.I take great pride in the products that I make. I hope you enjoy my digital kits to showcase your memories. I have really enjoyed my 1st year of designing and getting to know alot of you as my customers. I was so honored and so excited to get Top Designer of the Year for 2012-2013... It was such a great accomplishment for me. I couldn't believe getting it only after 1 year of designing. I have a special group on facebook.. It is called Touched By A Butterfly Gallery. It is a fun place to share your layouts you make using my kits. Comment below and tell her YOUR favorite kit!! $75.00 shopping sprees in her shop!!! Comment NOW! I love your work and already a member. I cannot pick a favorite because there are so many items that I have seen of your creations, I love them all. Thank you for the chance to win this gift! All your stuff is so cute, but right now I am loving Gingerbread fun! Thanks for the chance at winning! Merry Christmas! I love all your designs but, this time of year it would have to be the snow globe kit! Keep up the good work and I appreciate your fan freebies! I thought I was leaving my name, I guess I am not tech savy, that was my comment about the snow globes. I have to say I completely love all your designs but I'm really lovin your gingerbread kits. Keep the wonderful work coming!!! I know when I see it is designed by you it is going to be something I like! Right now I have my eye on Elegant Christmas. Thank-you for the most fabulous year. The day I became one of your CT's was the beginning of the most fun and exciting new hobby for me. I am grateful for all that you have taught me and the confidence you have given me to continue. Love you! thanks for the chance. too many gorgeous kits to pick just one. but at the moment im loving the snow globe kit!! Thanks for a chance to win the prize! I love so many of your kits! Right now I like the whimsy in Bee-u-tiful. I just LOVE the Snowglobe kit! Your kits are so cute and colorful. Love the kits you create and own several already. Thanks for all your generous freebies also, wonderful creations. Elegant Christmas sure is beautiful but it is hard to pick just one. Thanks for the chance to win! Thank you sincerely for your generous heart. God bless you. Well Celeste, I think you are the most talented designer I know, virtually anyways, lol. Even my grandkids think your work is fun and colorful. I love all your work and you are just too generous. TY for this great opportunity. Thank you for this great opportunity!! WOW!! All of your kits are great! I really like "Winter Wonderland". I love your kits! I have been a fan of yours on facebook for awhile. I love all of your work! !